If at times reviewing rock’s early efforts in such depth becomes a bit too studious for its own good, leave it to Crown Prince Waterford to come along and render any meaningful analysis completely irrelevant. By now it’s pretty much a given that when his name appears in the lineup for upcoming records there’s going to be no need for serious dissertation because what Waterford specializes in is gleefully inappropriate fun and reckless good times. There’s never deeper meaning lurking under the surface of his songs, no reading between the lines to understand his intent, everything is presented at face value, often shamelessly so when the topics are off-color bordering on obscene. The Crown Prince makes no apologies for any of this which always makes his records enjoyable to revisit, even if the results of his efforts swing wildly between very entertaining and utterly chaotic. Either way though after jumping aboard the Crown Prince Waterford musical roller coaster you’re sure to be left with your senses a lot more frazzled than they were before the record started. So with that said, buckle up and hang on tight, the ride is about to get underway again. This is our fourth meeting with the spectacularly, and accurately, named Crown Prince Waterford, a colorful character whose best attribute – his hell-bent enthusiasm – also has proven to be his greatest stumbling block, as he sticks closely to the same state of mind, the same song really, that he’s offered up before. Truth be told that’s a fairly common artistic shortcoming at this point in rock’s story. With recording sessions in late 1947 needing to stockpile songs for a prolonged recording ban companies were squeezing out as many cuts as possible from their artists. In Waterford’s case he entered the studio just once for Capitol, on November 19th, but rather than the laying down the standard four songs that day he cut a double session of eight. No doubt as soon as he left the studio another artist was waiting to go in and do the same thing. Because of this there was no time to work up new ideas, no time to try different arrangements with the band, nor even just to work out the kinks from their first or second take. It’s likely they wouldn’t GET more than two takes of any song. The goal here was quantity, not quality, and as a result there was a tendency to recycle the strongest material just to be able to tackle things the artist and musicians were familiar with and presumably comfortable doing. The label execs surely figured that with the subsequent releases being spaced far apart there’d be few who would notice, or care, as long as the songs played to the artist’s strengths. Contrary to those beliefs it proved to be a rather shortsighted plan of action as consumers were far more savvy than anticipated and were able to pick out the records containing the best use of the same melodic attributes while letting the inferior replications slide into the abyss. But by late 1948 when this last effort from the previous year was slated for release, and with the ban still ongoing, there was little that could be done to rectify that problem, save for cutting illegal sessions on the sly, something Capitol Records, being a more scrutinized major label was less inclined to do, especially for one of their few rock acts whose returns thus far weren’t likely to place him in their long-term plans. So in retrospect this becomes another of those crucial “context” lessons as this trend was but an unfortunate reality for that brief time period for all types of artists, those who were highly skilled as well as those who were fairly non-descript. Waterford falls somewhere in the middle, his talents in one energetic style are certainly endearing but at the same time their built-in limitations resign him to being a fringe player in the big scheme of things. In the end he’s just good enough to not be an historical afterthought, yet never threatening to be more than a charming oddity. As November rolled around with the musician strike on the verge of mercifully ending Capitol Records was emptying their shelves and Waterford himself was about to be cast adrift, his shot at the big time now over. But while we still have him in front of us to inspect let’s not simply pass Waterford off as an unimportant also-ran just yet. For while he was very one-dimensional in theme and delivery those attributes still have their appeal, even thrice warmed over. While his three previous releases were all cut from the same cloth, uptempo odes to carnal relations with Waterford’s frantic vocals running neck and neck with the musicians in a mad dash for the finish line, here we get a slight change out of the gate with a nice guitar opening rather than the usual pounding piano. That alone gives Leaping Boogie a different feel – not just for Waterford, but rock in general, which still wasn’t featuring guitars very prominently at this point. The infectious sound lifts your hopes that maybe they were going in a different direction on this one after all. Unfortunately it settles back into its predictable groove almost immediately, with Waterford’s now familiar vocal patter sounding interchangeable with everything we’ve heard from him to date. He’s singing with the same brand of infectious enthusiasm, which surely has its charm even if it DOES sound like déjà vu, but its effectiveness can’t help but be diminished for the simple fact the game itself has changed in a year since we first encountered his brand of rowdy antics. Back in late 1947 this type of rambunctious attitude was refreshing to hear. Rock was still working out its own kinks and Waterford’s unbridled vocal assault pushed the envelope in many ways, standing out amongst the more restrained leads he was competing with. For that reason alone he was a welcome presence on the scene, setting new standards in terms of pacing and salacious content that rock needed to help truly set it apart from everything that came before it. But once we turned the corner into the new year others with even more talent in more areas surpassed Waterford who remained stuck re-plowing the same field each successive time out. It didn’t help of course that his first release, Move Your Hand, Baby had been the best written and best performed, not to mention the most lyrically shocking, of his repertoire. Once he’d connected with that everything to follow was going to be seen as a let-down by comparison. With Leaping Boogie, the final cut they put to wax, I think they all understood this. A look at the session information seems to confirm they were merely filling up tape as the day wound down. The reason for this being that, according to the information at hand – as improbable as it is to consider – pianist Pete Johnson, one of the foremost masters of the instrument in the world, lest you forget, and drummer Jesse Price actually switched seats, with Johnson picking up the sticks and Price pounding the ivories. If that is indeed true it suggests that they were all basically just screwing around and having fun at this point, either never thinking the eighth side would see the light of day or not particularly caring if it did. As a result the record has even a slightly more loose and haphazard feel to it, a little cruder, but still adhering to the same basic framework of the earlier sides. Let it also be said that Jesse Price is a better pianist than he was a drummer, as he gives a pretty good showing on his part here including a solid solo in the first half. He’s no Pete Johnson, but then again, who is? As for Johnson his first instrument when starting out as a kid in the 1920’s was drums so it’s likely this idea was done with him in mind, but he’s not given much to do here, he’s simply a placeholder in the arrangement which is simplified from what we’ve come to expect from them. Tiny Webb’s guitar lead quickly gets absorbed into the main piano riff and other than Maxwell Davis jumping in for an extended solo on sax, adding a measure of class to the proceedings as always, the rest of the way they’re just playing for kicks. For the first time we’ve heard the Crown Prince takes a relative backseat on this one, which is further evidence that it was something of a throwaway number. He’s revved up as usual, dropping his trademark vocal tics in at appropriate times – loudly emphasizing the first word of certain refrains, whether called for or not, and changing his tone on “get somebody KILLED” to add a measure of worried surprise – but Waterford’s arsenal of skills is quite limited, though reasonably effective if applied properly. Last time out, on Strange Woman’s Boogie it was misplaced, his exuberance ill-fitting for the storyline, even though if you ignored WHAT he was saying you could still get something out of it for the infectiousness alone. Here, despite this coming off as an even more slapdash song in some ways his strengths work rather well with the composition, especially because he’s not given quite as much responsibility to carry it (his vocals take up only a minute of the 2:40 play time), leaving plenty of room for the loose jam session nature of the record to take hold. In many ways Leaping Boogie is a mere appropriation of the typical Crown Prince Waterford brand of rock ‘n’ roll. When the musicians were playing their assigned roles on their proper instruments on previous releases the manic intensity dominated everything, as they were all using a much higher octane fuel than is exhibited here. Those who encountered those songs for the first time on our pages, or who stumbled across these sides on their own prior to that, I’m sure would be inclined to prefer that type of balls to the wall style to this, which comes off as a bit unambitious by comparison, far more restrained and certainly less technically proficient thanks to musicians switching places on a lark for this one. I can certainly understand the mentality of getting what you paid for when it comes to frenzied performances. In that regard, yes, all three of the previous releases were better suited as storming rockers for kick-starting a Saturday night at whatever juke joint, barroom or dance hall offered the rowdiest action. After your fourth or fifth shot of the hard stuff it wouldn’t quite matter what those records shortcomings were because the package they were wrapped in was so explosive. But here’s the case to be made for Leaping Boogie as a fitting epitaph for the short-lived major label foray of Waterford: Maybe because it took the same basic song structure as the others but delivered it a little less seriously, easing off on the intensity enough to allow us all to see beyond the caricatures they were offering up their previous times out. For once he’s not attempting to convince us of being faster than a speeding bullet, able to satisfy a woman in a single bound… instead he’s winking at us while playing the same role, letting us know it’s all a put-on for our amusement, and maybe for their amusement as well. It’s that rare glimpse of humanity that elevates this, just a bit, past his previous two outings, even as it’s not as proficient in many ways. This one allows us to see Charles Waterford as much as it does Crown Prince Waterford and I for one am grateful for that opportunity. In the end Waterford’s career in rock boils down to a few hard and fast truths. Nothing he did was refined. It was hardly classy. Not even very ambitious. But for all of its flaws at times his basic concept WAS solid, his performances were workmanlike and the results as a whole were never less than effective for adding to the mayhem that rock ‘n’ roll was already cornering the market on. Crown Prince Waterford’s role in helping to spread this music may have been rather slight, despite the high profile label he was afforded the chance to appear on, but his overall presence on the scene added a bit more flavor to the mélange of characters who wandered in and out of the scene. There are worse things to be than reliable and when it came to creating this type of atmosphere Crown Prince Waterford was nothing if not reliable. 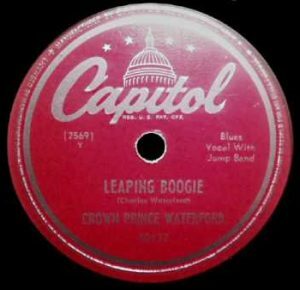 Leave a reply on "Crown Prince Waterford: “Leaping Boogie”"